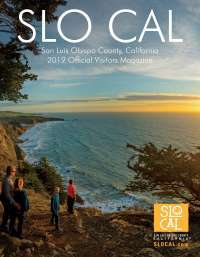 San Luis Obispo County, January 28, 2016 â€“ Glistening blue waves, lush vineyards and golden sunlight beckon as they welcome you to San Luis Obispo County, rich in charm, romance, and breathtaking beauty. Located halfway between Los Angeles and San Francisco, the regionâ€™s diverse landscape isnâ€™t simply where romantic dreams are made. Mere moments from shimmering beaches, world-renowned wineries, and gorgeous pastoral vistas, San Luis Obispo County boasts a one-of-a-kind backdrop for every couple. Allow 80 miles of pristine coastline and spectacular swaths of untouched forestland to ignite your heartâ€™s desire. Among the surf, sands, and soil, discover copious options for love-stricken couples looking to cherish quality time together. With so many idyllic activities to choose from, and in the spirit of love and Valentineâ€™s Day, explore these top five notions for planning a romantic outing and weekend away. Beach bonfires are an especially romantic treat enjoyed along Central Californiaâ€™s coast any time of year. Watch the sunset light up your loveâ€™s eyes, light a fire in the sand and relish the warm glow of the flames as you listen to the waves and roast sâ€™mores on one of the many San Luis Obispo County beaches. Take the experience even further with Beach Butlerz, which creates a memorable occasion with one of their five beach bonfire packages, including a romantic beach bonfire complete with a canopy and plush pillows. Just select a beach in Cambria, Morro Bay, Cayucos, Avila Beach, Pismo Beach, Grover Beach or Oceano, and Beach Butlerz will set up the experience so all you have to do is arrive, sit back, relax and fall in love. Point San Luis Lighthouse and Piedras Blancas Light Station are each located on expansive coastal vistas along San Luis Obispo Countyâ���™s Central Coast. These iconic, historic structures hold a romantic allure and both offer spectacular tours. The Piedras Blancas Light Station is managed as an historic park and wildlife sanctuary and is part of the federally designated Outstanding Natural Area. Originally built in 1890 and beautifully restored, the Port San Luis Lighthouse provides a glimpse into the lives of lighthouse keepers and their families. The lighthouse also offers a stunning backdrop for that perfect engagement or wedding day. Let your love shine as the two of you go hand-in-hand on a tour of a lighthouse. After the tour, head over to the San Luis Obispo Little Theater for an evening show. Itâ€™s a quaint, intimate venue that is one of the oldest continuously running community theatres in the nation. Wine tasting in San Luis Obispo County can be filled with romance, especially when it includes a visit to one of the award-winning wineries in Paso Robles or San Luis Obispo. Find a quiet spot to lay a picnic blanket and open a bottle of wine, along with some fresh fruit, cheese and bread. Hire someone to do the driving for you like Breakaway Tours, 101 Wine Tours, or Uncorked Wine Tours. Discover beautiful vistas and rolling hills, or perhaps Heart Hill Vineyard at Niner Wine Estates, featuring a naturally occurring heart-shaped grove of blue oaks. End your evening dining in downtown Paso Robles, Atascadero, San Luis Obispo or Arroyo Grande where your taste buds will fall in love with the sweet treats of farm-fresh cooking. Explore one of the dozens of trails in San Luis Obispo County, like MontaÃ±a de Oro State Park, one of areaâ€™s most stunning and serene coastal locations. Explore the seven miles of rugged coastline, secluded beaches and coastal plains, and 8,000 ocean-front acres of hiking, biking, equestrian trails, breathtaking coastline, cliffs and tide pools. Immerse yourself in the natural beauty with a hike to find wildflowers, and then relax on the sandy shore at Spooner&apos;s Cove. Kick of your shoes and dip your toes in the water as you enjoy the sun setting amidst the ocean backdrop and emerald rolling hills. San Luis Obispo County is the perfect place to take your love to the next step. Discover intimate chapels, historic missions, charming churches, and picture-perfect vineyard venues as unique as your love. Exchange vows under the branches of an ancient oak tree or say, â€œI do,â€ amidst the brilliant fauna of a centuries-old adobe garden. Your choices are varied, vivid and all within San Luis Obispo County. February is Romance Month in San Luis Obispo County, and all month long, you and your sweetheart can delight in a collection of deals to help plan a romantic getaway. Explore luxury oceanfront resorts refreshed by invigorating coastal breezes, wine country bed and breakfasts and vacation rentals ranging from hip to quaint, and modern hotels boasting cutting-edge amenities, local color, and unforgettable epicurean delights. Only in February 2016, enter the Visit San Luis Obispo County Mini-Moon Giveaway, where you can submit a photo of you and your sweetheart for the opportunity to win a two-night stay in San Luis Obispo County, along with lunch, dinner and activity gift cards. Visit www.VisitSanLuisObispoCounty.com for more information.